Not all sugar is created equal. While we tend to think of sugar as the white foodstuff we buy in bags and that’s a major contributor to conditions such as obesity and diabetes, there are actually many types of sugar molecule with different properties and effects. Now scientists have found that one naturally-occurring kind of sugar called trehalose could actually help prevent a type of liver disease. Could it be that eating sugar may not be so bad for us after all – if only we can find the right type? Although all sugars are composed of the same basic ingredients (carbon, hydrogen and oxygen), these components can be arranged in different ways, which can have very different effects on the body. For example, glucose is a type of sugar which is readily absorbed and converted to energy by all cells of the body. By contrast, fructose is taken up almost entirely by liver cells, where it is converted directly into fat. Eating too much fructose, which is found in fruit but also in soft drinks, can cause your liver to build up fat inside its cells, as can drinking too much alcohol. The non-alcoholic version of fatty liver disease (NALFD) is actually a relatively benign condition and the majority of those affected experience limited or no symptoms. But sometimes it can progress to hepatitis (inflammation of the liver), cirrhosis (tissue damage) and even liver cancer. This has become a serious public health problem because NALFD is now so common. It affects over one billion people worldwide and is found in up to 80% of obese people. At least one in ten liver transplants are due to conditions that progressed from NAFLD. Yet no drugs are presently available that reverse the build-up of fat in liver cells. Scientists at Washington University School of Medicine in St. Louis wanted to see if liver cells could be tricked into thinking that they were short of energy and so would eat their own internal fats, a process called autophagy. Recent research suggests this process of cellular spring-cleaning could reverse the build-up of damaging deposits related to a number of different diseases, including Huntington’s disease and Parkinson’s disease. To trick the cells, the Washington researchers turned to trehalose sugar, which is found in shiitake and oyster mushrooms. They found the trehalose efficiently blocked the uptake of glucose into liver cells. Confirming earlier work by other groups, they also showed that trehalose reduced energy levels in the cells and induced the hallmark features of autophagy. This proved that the liver cells had been tricked into a sense of starvation. The scientists then fed trehalose to mice that had developed fatty livers after eating a high fructose diet for ten days. Adding 3% trehalose to the mice’s drinking water induced markers of autophagy in their livers, reduced their blood levels of fat and cholesterol and prevented the accumulation of liver fat. The researchers suggest this means trehalose sugar may have the potential for use as a novel “nutraceutical” – a food product with medicinal or health-promoting properties – to treat NAFLD or even other diseases by triggering autophagy. 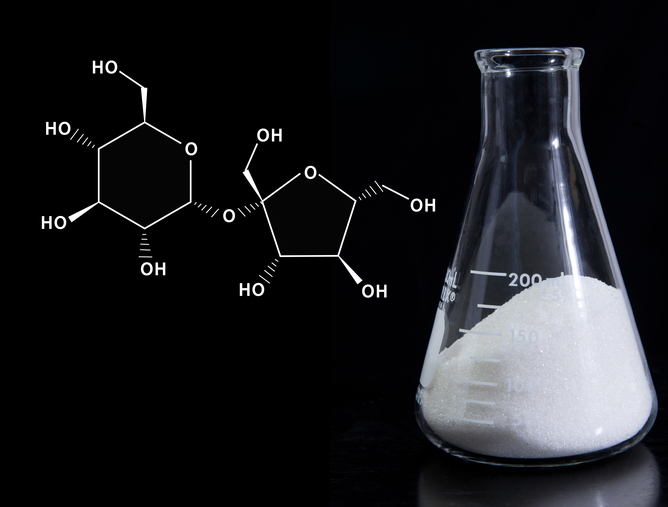 This isn’t the first time a sugar-related molecule has been proposed to have potential health-promoting effects. Oligofructose and insulin are both long chains of sugar molecules that increase levels of “good bacteria” in our guts and impart far fewer calories to the body than more commonly used sugars, although they are also much less sweet. As a result, they are considered by some to be beneficial for health. But before we start stirring trehalose into our tea, we should recognise that we don’t know what other effects large doses of the sugar might have on the rest of our body. For example, the way it blocks glucose uptake by cells is similar to the process that causes raised blood sugar levels in diabetes. Human intestines also contain the enzyme trehalase, which converts most of the trehalose we eat into glucose, so a large dose would probably be needed for the trehalose to reach the liver. For humans, ingesting an equivalent amount of trehalose as the mice in the experiment would mean consuming an additional 1,000 calories per day, which could result in significant weight gain. It seems unlikely that eating any sugar in large amounts would not come without potential health drawbacks. But even if trehalose does not turn out to be a new wonder sugar with the potential to treat human diseases, this new research at least gives us hope of finding a new way to tackle non-alcoholic fatty liver disease.